It will at once be evident that on this point the position will be different with respect to different kinds of knowledge; and the answer to our question will therefore largely turn on the relative importance of the different kinds of knowledge; those more likely to be at the disposal of particular individuals and those which we should with greater confidence expect to find in the possession of an authority made up of suitably chosen experts. If it is today so widely assumed that the latter will be in a better position, this is because one kind of knowledge, namely, scientific knowledge, occupies now so prominent a place in public imagination that we tend to forget that it is not the only kind that is relevant. It may be admitted that, as far as scientific knowledge is concerned, a body of suitably chosen experts may be in the best position to command all the best knowledge available—though this is of course merely shifting the difficulty to the problem of selecting the experts. What I wish to point out is that, even assuming that this problem can be readily solved, it is only a small part of the wider problem. Today it is almost heresy to suggest that scientific knowledge is not the sum of all knowledge. But a little reflection will show that there is beyond question a body of very important but unorganized knowledge which cannot possibly be called scientific in the sense of knowledge of general rules: the knowledge of the particular circumstances of time and place. It is with respect to this that practically every individual has some advantage over all others because he possesses unique information of which beneficial use might be made, but of which use can be made only if the decisions depending on it are left to him or are made with his active coöperation. We need to remember only how much we have to learn in any occupation after we have completed our theoretical training, how big a part of our working life we spend learning particular jobs, and how valuable an asset in all walks of life is knowledge of people, of local conditions, and of special circumstances. To know of and put to use a machine not fully employed, or somebody’s skill which could be better utilized, or to be aware of a surplus stock which can be drawn upon during an interruption of supplies, is socially quite as useful as the knowledge of better alternative techniques. And the shipper who earns his living from using otherwise empty or half-filled journeys of tramp-steamers, or the estate agent whose whole knowledge is almost exclusively one of temporary opportunities, or the arbitrageur who gains from local differences of commodity prices, are all performing eminently useful functions based on special knowledge of circumstances of the fleeting moment not known to others. It is a curious fact that this sort of knowledge should today be generally regarded with a kind of contempt and that anyone who by such knowledge gains an advantage over somebody better equipped with theoretical or technical knowledge is thought to have acted almost disreputably. To gain an advantage from better knowledge of facilities of communication or transport is sometimes regarded as almost dishonest, although it is quite as important that society make use of the best opportunities in this respect as in using the latest scientific discoveries. This prejudice has in a considerable measure affected the attitude toward commerce in general compared with that toward production. Even economists who regard themselves as definitely immune to the crude materialist fallacies of the past constantly commit the same mistake where activities directed toward the acquisition of such practical knowledge are concerned—apparently because in their scheme of things all such knowledge is supposed to be “given.” The common idea now seems to be that all such knowledge should as a matter of course be readily at the command of everybody, and the reproach of irrationality leveled against the existing economic order is frequently based on the fact that it is not so available. This view disregards the fact that the method by which such knowledge can be made as widely available as possible is precisely the problem to which we have to find an answer. One reason why economists are increasingly apt to forget about the constant small changes which make up the whole economic picture is probably their growing preoccupation with statistical aggregates, which show a very much greater stability than the movements of the detail. The comparative stability of the aggregates cannot, however, be accounted for—as the statisticians occasionally seem to be inclined to do—by the “law of large numbers” or the mutual compensation of random changes. The number of elements with which we have to deal is not large enough for such accidental forces to produce stability. The continuous flow of goods and services is maintained by constant deliberate adjustments, by new dispositions made every day in the light of circumstances not known the day before, by B stepping in at once when A fails to deliver. Even the large and highly mechanized plant keeps going largely because of an environment upon which it can draw for all sorts of unexpected needs; tiles for its roof, stationery for its forms, and all the thousand and one kinds of equipment in which it cannot be self-contained and which the plans for the operation of the plant require to be readily available in the market. If we can agree that the economic problem of society is mainly one of rapid adaptation to changes in the particular circumstances of time and place, it would seem to follow that the ultimate decisions must be left to the people who are familiar with these circumstances, who know directly of the relevant changes and of the resources immediately available to meet them. We cannot expect that this problem will be solved by first communicating all this knowledge to a central board which, after integrating all knowledge, issues its orders. We must solve it by some form of decentralization. But this answers only part of our problem. We need decentralization because only thus can we insure that the knowledge of the particular circumstances of time and place will be promptly used. But the “man on the spot” cannot decide solely on the basis of his limited but intimate knowledge of the facts of his immediate surroundings. There still remains the problem of communicating to him such further information as he needs to fit his decisions into the whole pattern of changes of the larger economic system. It is in this connection that what I have called the “economic calculus” proper helps us, at least by analogy, to see how this problem can be solved, and in fact is being solved, by the price system. Even the single controlling mind, in possession of all the data for some small, self-contained economic system, would not—every time some small adjustment in the allocation of resources had to be made—go explicitly through all the relations between ends and means which might possibly be affected. It is indeed the great contribution of the pure logic of choice that it has demonstrated conclusively that even such a single mind could solve this kind of problem only by constructing and constantly using rates of equivalence (or “values,” or “marginal rates of substitution”), i.e., by attaching to each kind of scarce resource a numerical index which cannot be derived from any property possessed by that particular thing, but which reflects, or in which is condensed, its significance in view of the whole means-end structure. In any small change he will have to consider only these quantitative indices (or “values”) in which all the relevant information is concentrated; and, by adjusting the quantities one by one, he can appropriately rearrange his dispositions without having to solve the whole puzzle ab initio or without needing at any stage to survey it at once in all its ramifications. The problem which we meet here is by no means peculiar to economics but arises in connection with nearly all truly social phenomena, with language and with most of our cultural inheritance, and constitutes really the central theoretical problem of all social science. As Alfred Whitehead has said in another connection, “It is a profoundly erroneous truism, repeated by all copy-books and by eminent people when they are making speeches, that we should cultivate the habit of thinking what we are doing. The precise opposite is the case. Civilization advances by extending the number of important operations which we can perform without thinking about them.” This is of profound significance in the social field. We make constant use of formulas, symbols, and rules whose meaning we do not understand and through the use of which we avail ourselves of the assistance of knowledge which individually we do not possess. We have developed these practices and institutions by building upon habits and institutions which have proved successful in their own sphere and which have in turn become the foundation of the civilization we have built up. The price system is just one of those formations which man has learned to use (though he is still very far from having learned to make the best use of it) after he had stumbled upon it without understanding it. Through it not only a division of labor but also a coördinated utilization of resources based on an equally divided knowledge has become possible. The people who like to deride any suggestion that this may be so usually distort the argument by insinuating that it asserts that by some miracle just that sort of system has spontaneously grown up which is best suited to modern civilization. It is the other way round: man has been able to develop that division of labor on which our civilization is based because he happened to stumble upon a method which made it possible. Had he not done so, he might still have developed some other, altogether different, type of civilization, something like the “state” of the termite ants, or some other altogether unimaginable type. All that we can say is that nobody has yet succeeded in designing an alternative system in which certain features of the existing one can be preserved which are dear even to those who most violently assail it—such as particularly the extent to which the individual can choose his pursuits and consequently freely use his own knowledge and skill. It is in many ways fortunate that the dispute about the indispensability of the price system for any rational calculation in a complex society is now no longer conducted entirely between camps holding different political views. 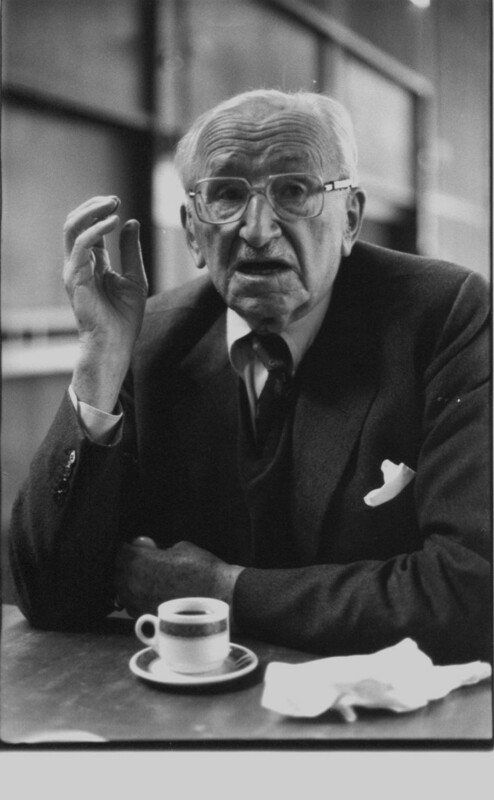 The thesis that without the price system we could not preserve a society based on such extensive division of labor as ours was greeted with a howl of derision when it was first advanced by von Mises twenty-five years ago. Today the difficulties which some still find in accepting it are no longer mainly political, and this makes for an atmosphere much more conducive to reasonable discussion. When we find Leon Trotsky arguing that “economic accounting is unthinkable without market relations”; when Professor Oscar Lange promises Professor von Mises a statue in the marble halls of the future Central Planning Board; and when Professor Abba P. Lerner rediscovers Adam Smith and emphasizes that the essential utility of the price system consists in inducing the individual, while seeking his own interest, to do what is in the general interest, the differences can indeed no longer be ascribed to political prejudice. The remaining dissent seems clearly to be due to purely intellectual, and more particularly methodological, differences. Taken literally, this statement is simply untrue. The consumers do nothing of the kind. What Professor Schumpeter’s “ipso facto” presumably means is that the valuation of the factors of production is implied in, or follows necessarily from, the valuation of consumers’ goods. But this, too, is not correct. Implication is a logical relationship which can be meaningfully asserted only of propositions simultaneously present to one and the same mind. It is evident, however, that the values of the factors of production do not depend solely on the valuation of the consumers’ goods but also on the conditions of supply of the various factors of production. Only to a mind to which all these facts were simultaneously known would the answer necessarily follow from the facts given to it. The practical problem, however, arises precisely because these facts are never so given to a single mind, and because, in consequence, it is necessary that in the solution of the problem knowledge should be used that is dispersed among many people. That an economist of Professor Schumpeter’s standing should thus have fallen into a trap which the ambiguity of the term “datum” sets to the unwary can hardly be explained as a simple error. It suggests rather that there is something fundamentally wrong with an approach which habitually disregards an essential part of the phenomena with which we have to deal: the unavoidable imperfection of man’s knowledge and the consequent need for a process by which knowledge is constantly communicated and acquired. Any approach, such as that of much of mathematical economics with its simultaneous equations, which in effect starts from the assumption that people’s knowledge corresponds with the objective facts of the situation, systematically leaves out what is our main task to explain. I am far from denying that in our system equilibrium analysis has a useful function to perform. But when it comes to the point where it misleads some of our leading thinkers into believing that the situation which it describes has direct relevance to the solution of practical problems, it is high time that we remember that it does not deal with the social process at all and that it is no more than a useful preliminary to the study of the main problem.